A grave containing a well-preserved skeleton dating from the 11th century has been discovered under a car park at Notre-Dame de Cherbourg (Manche), by Inrap archaeologists. "It is a remarkable burial. It is probably the only one we know of its type... at least in North Cotentin," said Laurent Paez-Rezende, a research scientist at the Institut national de recherches archéologiques préventives (Inrap). 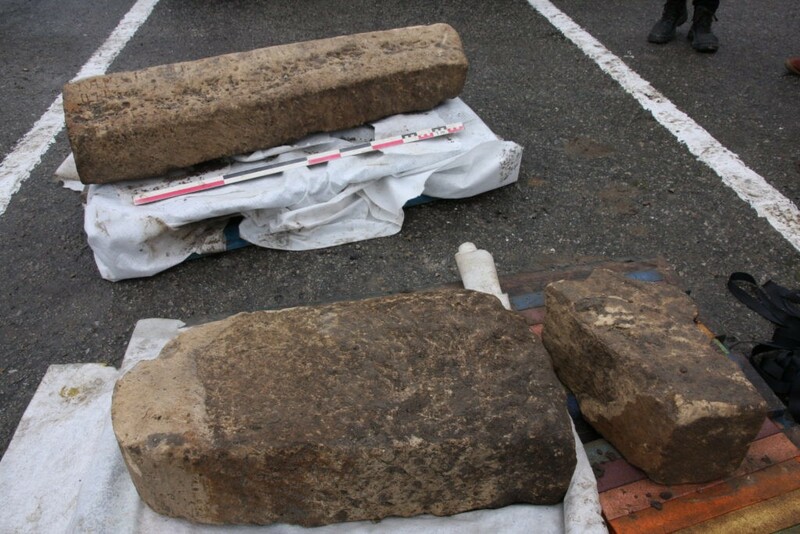 On Monday, March 11, 2019, archaeologists carrying out an archaeological survey in Notre-Dame Square in Cherbourg (Manche), which was based on earlier archaeological excavations, discovered a headstone 1.20 m by 30 cm high only a few dozen centimetres below the surface. "It initially reminded us of a Merovingian sarcophagus," explains Laurent Paez-Rezende. The tombstone is carved with a Latin epitaph. This is something that already reflects an exceptional character for archaeologists. 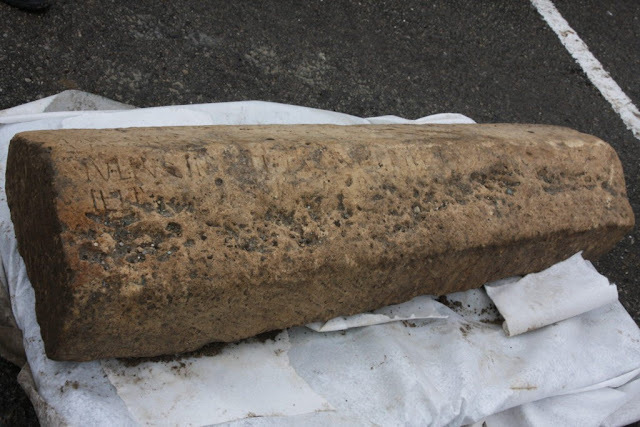 "On one side of the stone there was a block, on the other side a stele that went down to a depth of 80cm," explains the scientist in charge of the survey. For him, it is undoubtedly the most exceptional of the 300 tombs of the former Cherbourg cemetery. However, as this "prestigious tomb" emerged from the ground nothing was found beneath it. Archaeologists had to dig another 20 cm under the stele to "eventually reveal the skull, and then the well-preserved skeleton", says Raphaëlle Lefebvre, anthropologist for the Inrap. "This was probably the grave of an important person," says Laurent Paez-Rez-Rezende. "This tomb seems to have been sunk into the earlier graves of the cemetery. It probably dates from the 10th or 11th century. That is just before the cemetery stopped being used," he adds. Information on the occupant of the grave is being collected, though preliminary analysis suggests it was a woman. Samples will soon be taken to obtain more accurate dating and information from the sediments and bones present in the grave. The epigraphy of the tombstone will hopefully reveal the identity of the deceased. The skeleton will soon be taken to the Inrap base in Bourguébus (Calvados), near Caen. The stele and tombstone will remain in Cherbourg (Manche). The abbey of Notre-Dame-du-Voeu will soon house them. On the basis of excavations carried out in the 1970s, a second trench was dug by Inrap around a former dungeon site located at the other end of the carpark. Here also, the archaeologists were pleasantly surprised. "We have found two massive masonry structures 2.10 m wide, running parallel to each other and spaced 2.50 m apart. Under the the destruction fill, we found Roman tiles, ceramics, bones, wild boar tusks, and shells. The dungeon seems to have been erected over a large Gallo-Roman building," says Laurent Paez-Rezende. 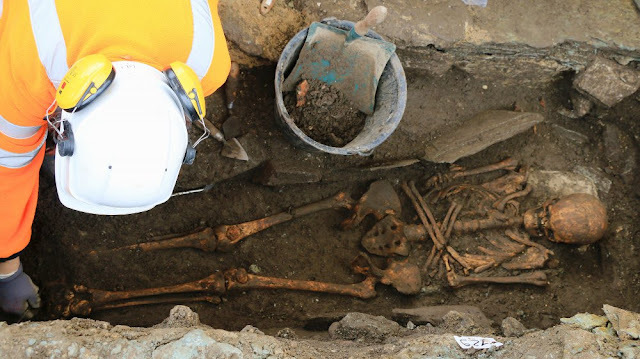 "These remains probably belong to a large public building from the ancient city of Coriallo", he said.